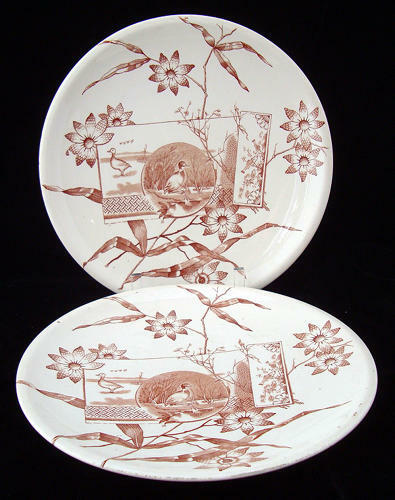 These hand applied transfer Victorian aesthetic 9 5/8 inch wide brown transferware plates are transfer printed in brown. The pattern features fabulous flowers that surround the Japanesque cartouches of Ducks and Fish interwoven with geometric designs. The pattern displays the Victorian eras love of nature. A perfect aesthetic plate. The pieces are marked on the underside with an impressed registration mark, the pattern name and trademark that identifies the maker as Edge Malkim, a pottery maker working in Cobridge in the Staffordshire region of England during the 19th century.